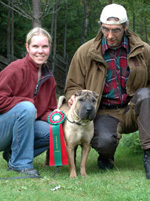 ”Skrynkel”, the first shar pei to become a Field Tracking Champion! Once again our wonderful breed showed the world that they are capable of nearly everything! It was a great class and the first time we met, Helena explained all about the fieldtracking and the tecqnique of laying the track ourself. Because the class wasn´t just for the dogs it was for us too, to learn to do it ourself. So we met four times during two weeks and we and the dogs learned a lot. Skrynkel was still young, just 7 months so he took it at his own speed but he was making progress and I saw that he liked it. So after the class was finished I started to do my own tracks for him and he became rather good at it. But those tracks I did in the beginning was not as near as long as the tracks the dogs take on when they compete, or track for tracking an injured deer or something. Anyway I continued to do small tracks for Skrynkel during the fall but when we moved to another city, Stockholm, it became harder to find places to lay the tracks. But one day a friend told me that she knew about a woman who layed tracks for you, and train you and your dog. So I gave her a call and I made an apointment for Skrynkel and I the week after. At the same time I entered Skrynkel to a test. The Aptitudetest for fieldtracking. It´s the test you have to take to be allowed to compete in the open class and to have the chance to attend the competitions and maybe become a Fieldtracking Champion. The only problem was that the test apointment was before the training apointment but I thought that Skrynkel and I would give it a go anyway…. What a disaster! 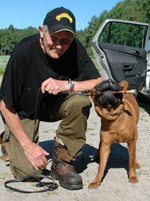 First of all the judge did wrong from the beginning… When you do fieldtracking there is allways a starting point which is a place with a lot of blood on the ground, so the dog can really get the smell in their nose and it´s very important for the dog to have a good start. But this judge didn´t find the starting point for Skrynkels track so you can imagine how it all went… For 10 minutes the judge and I was running around looking for the beginning and when we had not found it the judge told me to start Skrynkel anyway. Hm…poor Skrynkel! He had no idea what to do because one drop of blood is not easy to start from. So the whole test was a disaster. We didn´t pass the aptitude test as you can guess. But the week after, we started track training with our new friend, Libban, and Skrynkel showed himself to be a great tracker. After four weeks of training, once a week, I entered him to an aptitude test again and this time it was no problem! He passed it and we where now good enough to go for the open class! The aptitude test is a 500-600 meter long track made with blooddrops from a cow or a pig, apx 1.0 to 1,5 meters between the drops, and the smell of a ”foot” from a deer, in the forest. 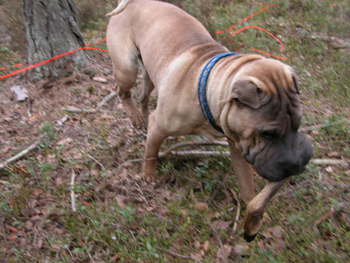 The dog has 45 min to find the deerfoot in the end of the track and it´s 4 angles, 90 degrees, and 15 meter without blood somewhere along the track, just the deerfoot smell. The track has been out for 2-5 hours. Your connection to the dog is a 10 meter line and a harness. You should be about 5 meters behind the dog in the track but are allowed to pick up more line and be nearer the dog if the terrain is hard. You are also allowed to let the line go and pick it up again if it´s around a tree or something. After we got the approval to enter in open class we started to practise for it. But one important thing is not to do it too much because the dog can be fed up with tracking and that is not what we want! To get Skrynkel even more motivated I sometimes hide or give him swedish meatballs when he comes to the trackend and the deerfoot. He looks so surprised and looks at me like”-Wow, mum! Meatballs in the forest! Great!”. And the next time we track he is more motivated. Because who knows? Maybe it´s a bunch of meatballs in the end too? 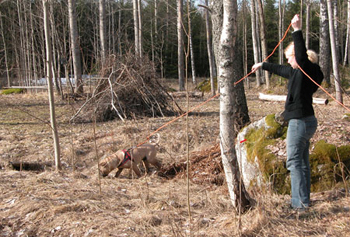 The open class is sometimes no different for the dog but for some dogs it´s hard work to take a open class track. Skrynkel reacted in a good way. He thought it was even more fun when the track had been out for a longer time and the shot! Oh my! He loves it! Skrynkel works even harder when the track has been out for a longer time. He concentrates more and it´s great to see that he enjoys it! The tracks in open class have always been out over night and between 12-24 hours so many live animals have been walking over the track and that makes it much harder for the dog. When Skrynkel did his second open class track he picked up a ”live-track” and went off in another direction. 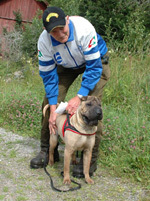 On the tests the dog is allowed to do this once and if you tell the judge that the dog is off the test track he shows you and the dog back to the test track and let you start your dog again on the place he went off without drawing any points. But if the dog does this again and you ask for help you can forgot the First Prize. And it´s the First Prize you want! One difference between aptitude test and open class; you have a part on the track, placed in an angle, where only the deerfoot smell is used, like a ”blindtrack” for about 10 meters and in the other direction is the real track continuing. If the dog takes off in to the ”blindtrack” , it should turn around and come back and continue tracking on the real track with the smell and blood. 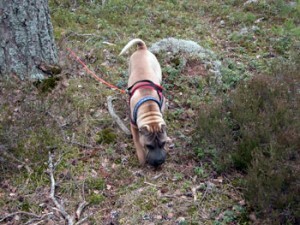 Skrynkel had problems with this part the first time but he sniffed around in a circle and found the real track again. The second time the wind was right so he found the real track immediately and didn´t go on to the ”blindtrack”. And then the other big difference. The shot! The judge shoots up in the air with a rifle or a startgun between 50 and 100 meters from the trackend. This is to simulate that the hunter has found the injured deer and shoot it. So you stop the dog, hold it and the judge goes away about 15 meters and shoots up in the air. Skrynkel loves it and I can see all the adrenaline running through his body. When I tell him to track again he runs back on the track and searches for the deerfoot like crazy!. And the happiness is great to see when he finds it! What ever track you are doing, training, aptitude or open class you are not allowed to help your dog in anyway and at the aptitude test and open class you have no idea where the track is. You just have to trust your dog! It´s hard sometimes when your dog is just running around and doesn´t seem to do anything right but wait and see often everything works out and the dog finds the track again. Skrynkel did a good job and the took 4 tracks in the open class and gained 3 excellent and one zero (but we just want ot forget about that one! 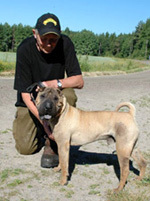 LOL) So I can now proudly present Swedish Field Tracking Champion (Sv CH) McCarthys Cadillac Blue Dynamite aka Skrynkel. 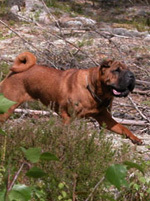 At this time (Okt -07) I have 3 Swedish Field Tracking Champions in my kennel and all my dogs (except for Ulrik yet) has passed the aptitude test or more, which I’m very proud of. 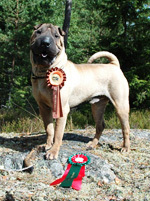 first shar pei ever in Norway to get the title. Skrynkel took his second First Prize in open class! Moonie took her first First prize in open class!